At the heart of In Our Backyard was a theatrical production of the classic Israeli children’s book Room for Rent. 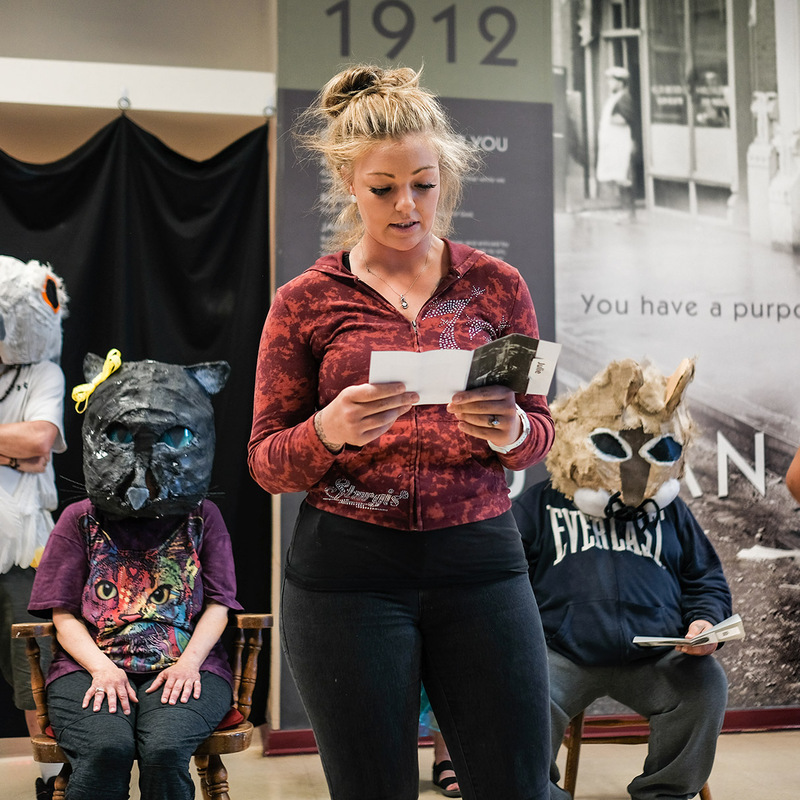 The performance integrated the text of the book with original texts by the performers and writers, all of whom are residents of Tacoma with lived experiences of homelessness. 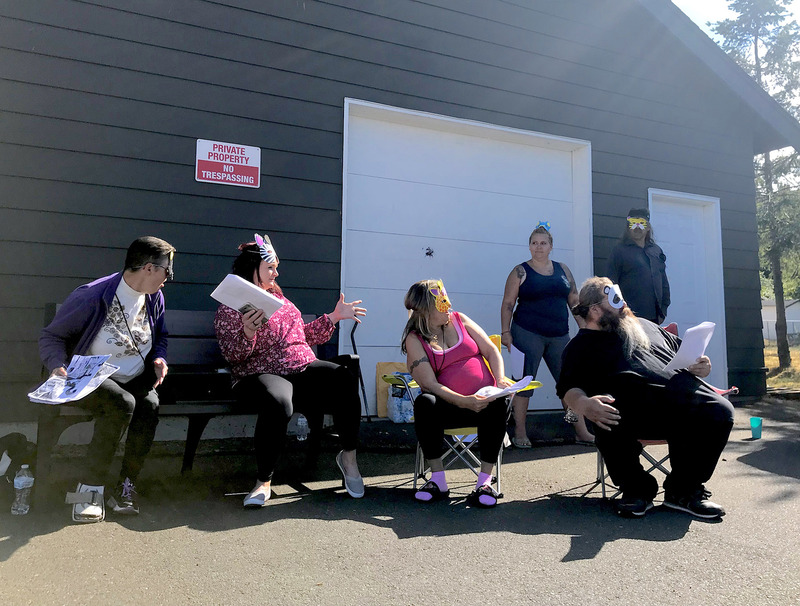 The play was performed five times in indoor and outdoor locations across Tacoma, and was followed by a conversation that encouraged audience reflection and response. 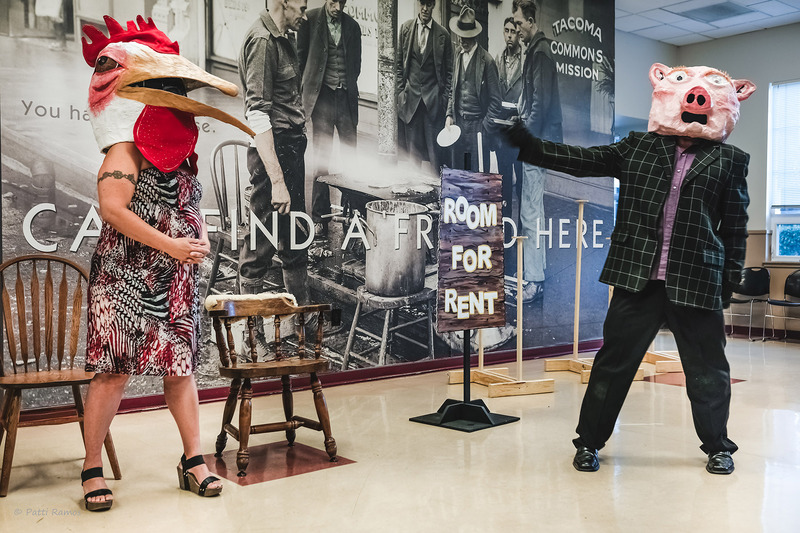 The production was a result of several partnerships with organizations and institutions around Tacoma. 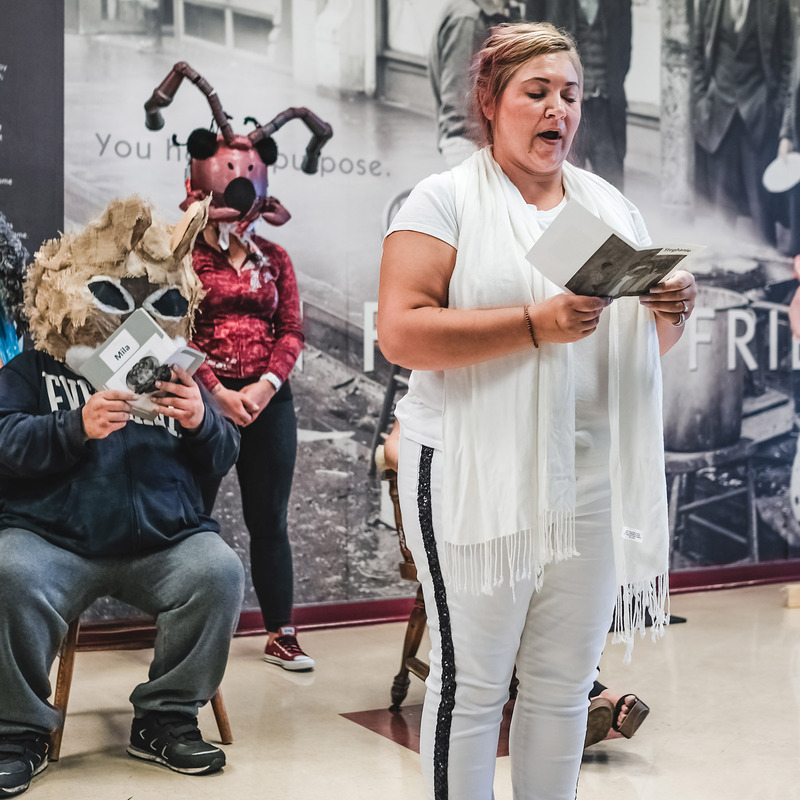 All workshops and rehearsals leading up to the performances took place at the Nativity House, a shelter and services provider operated by Catholic Community Services in Tacoma. 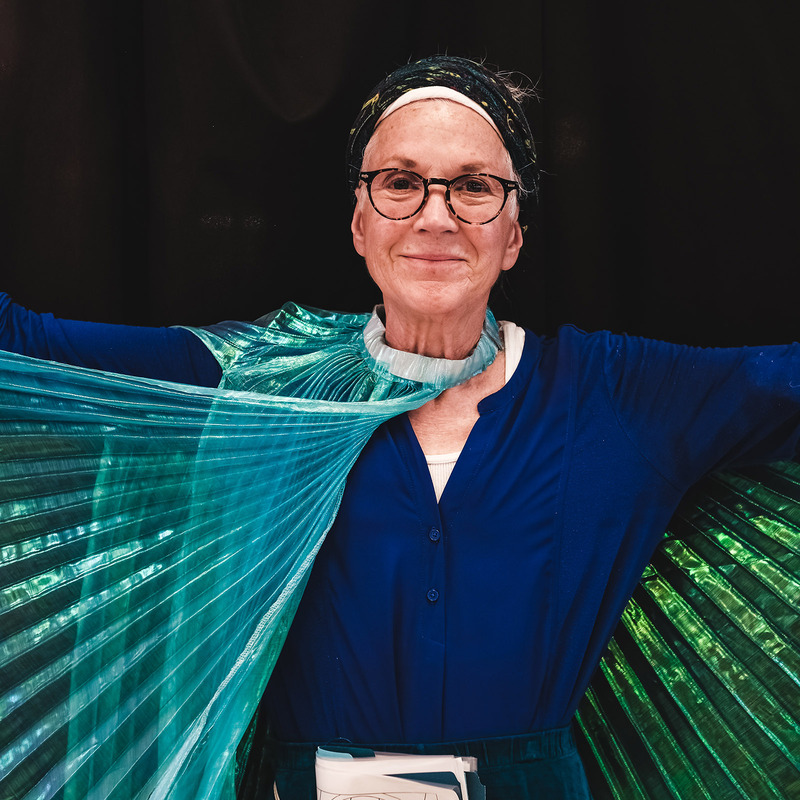 The initial collaboration between Roni Chelben and the Nativity House clients was a natural alignment. 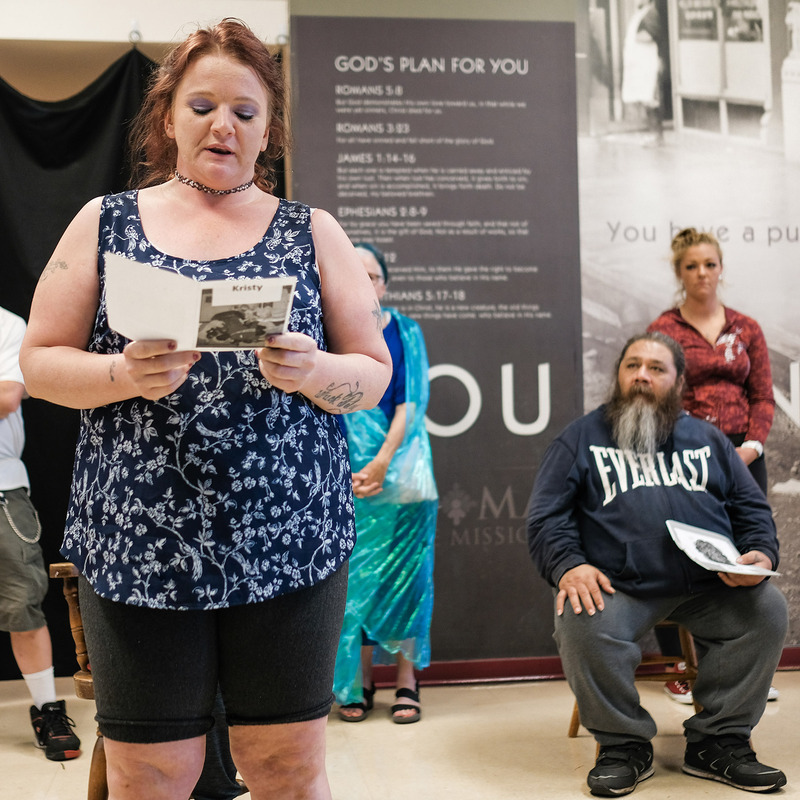 Volunteers and clients at Nativity House already had established the Rock Bottom Theatre group and from there, they expanded, adding a team of energetic women advocates, all participants of the New Life Program run by Tacoma Rescue Mission. 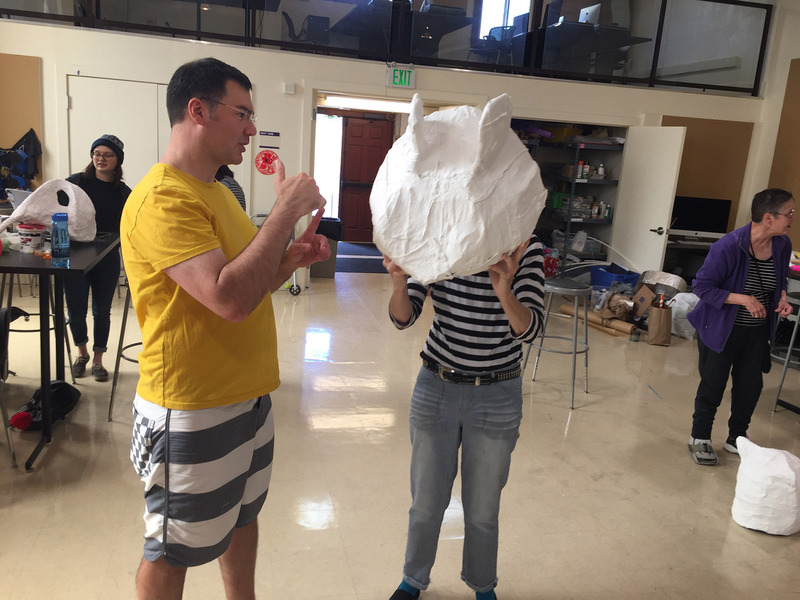 The production process started with group building and theatre training workshops, and gradually shifted focus to the play Room for Rent. 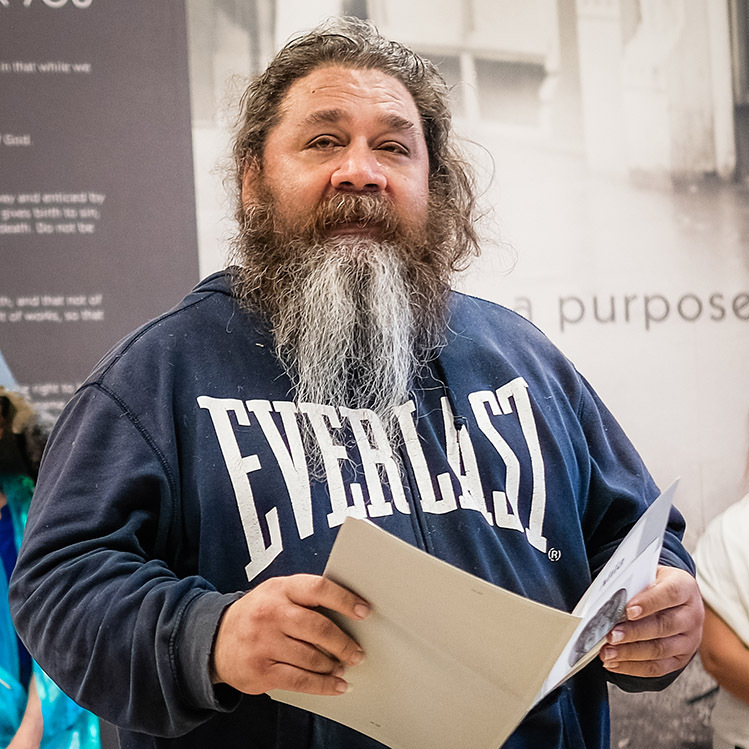 All participants wrote their own personal text with the goal of conveying their messages about homelessness to the larger community. 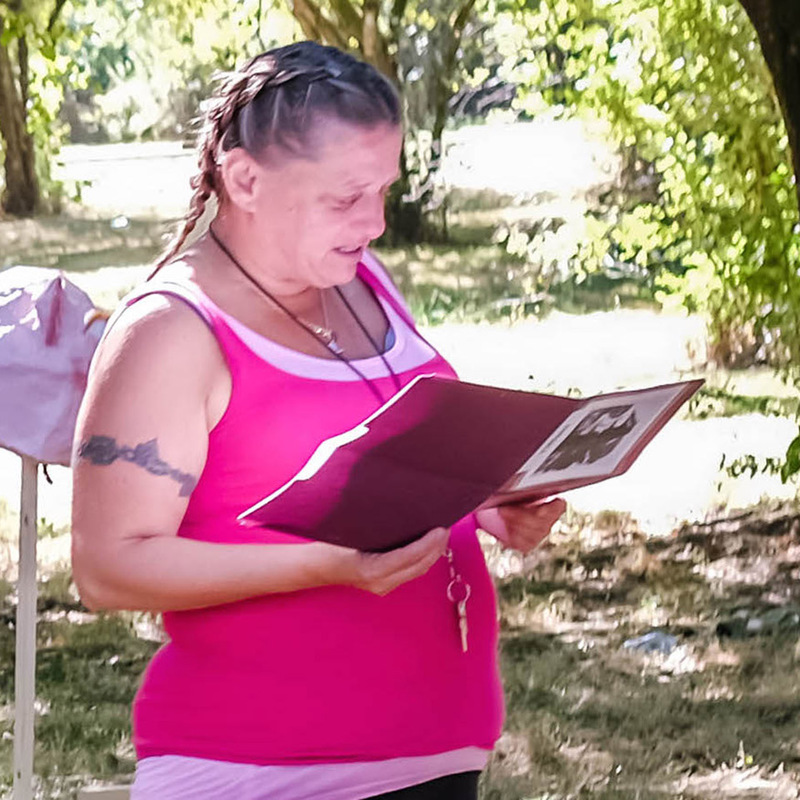 A few goals were prominent for all participants: illuminating stereotypes; humanizing those who are experiencing homelessness; and raising awareness that people experiencing homelessness are usually deeply dismissed, and ignored by others. 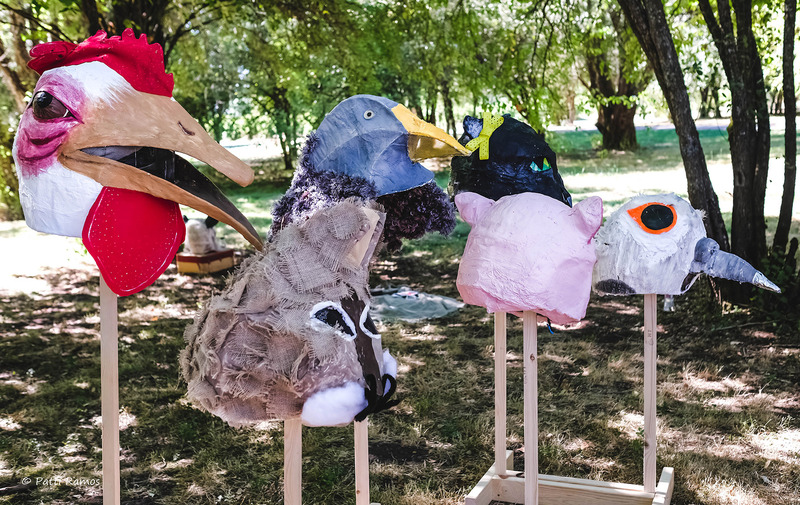 The masks for the performance were designed and built by sculpture students in the Reconstructing Self in Art class at University of Washington Tacoma , under the guidance of Professor Tyler Budge. 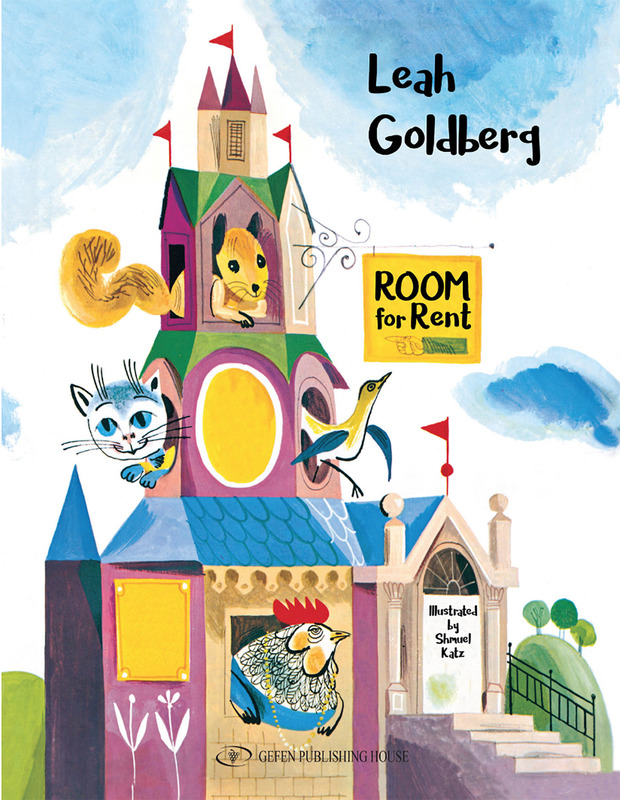 Room for Rent is based on a prominent classic children's story, first published in 1948 in Israel, by the Israeli writer and poet Leah Goldberg. The book is an allegory, telling the story of animals living as neighbors in a shared building, facing the trouble of finding a tenant for an empty apartment on the fifth floor. The prospective tenants who examine the apartment all have reservations regarding different qualities of the neighbors. I have not experienced homelessness. 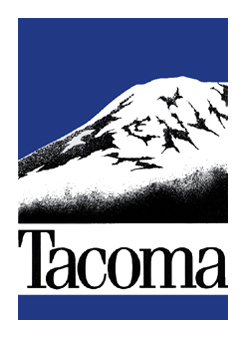 Throughout my career as a counselor/social worker for Tacoma Public Schools I met students and their families, who were homeless. I have often thought, what if I became homeless? What if I Iost my source of income? What things would I carry around with me, where would I sleep at night that was safe? Where could I wash and use the bathroom? Where would I get food and meals, and clothing? What would it feel like to be stared at like an undesirable or even worse, treated like I was invisible? I would feel others always judging me. People would think they can guess my story. I must be a druggie, or crazy. What if no one ever gave me a chance at housing, or a job? If I was sick, what would I do? What if there never was room for me in a shelter? What if I had no hope that life could get better for me? Would I wander endlessly the streets of Tacoma, no place, to put my bag down and call a space my own? 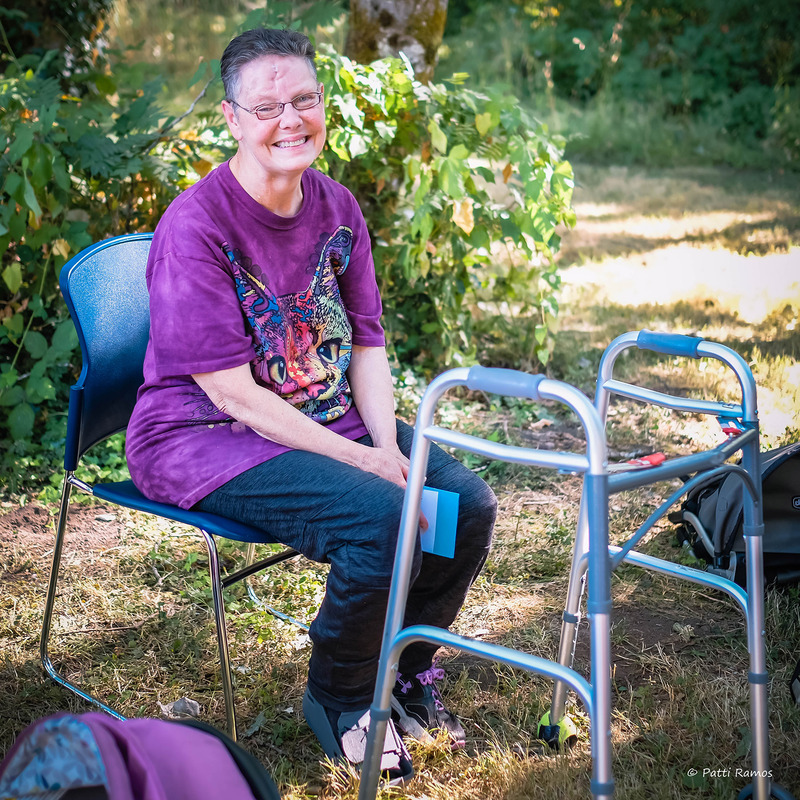 I would be one of 10,000 homeless or one child, in a group of 5000, here in Pierce County. I don’t think I could survive under those conditions. My fellow cast members have. 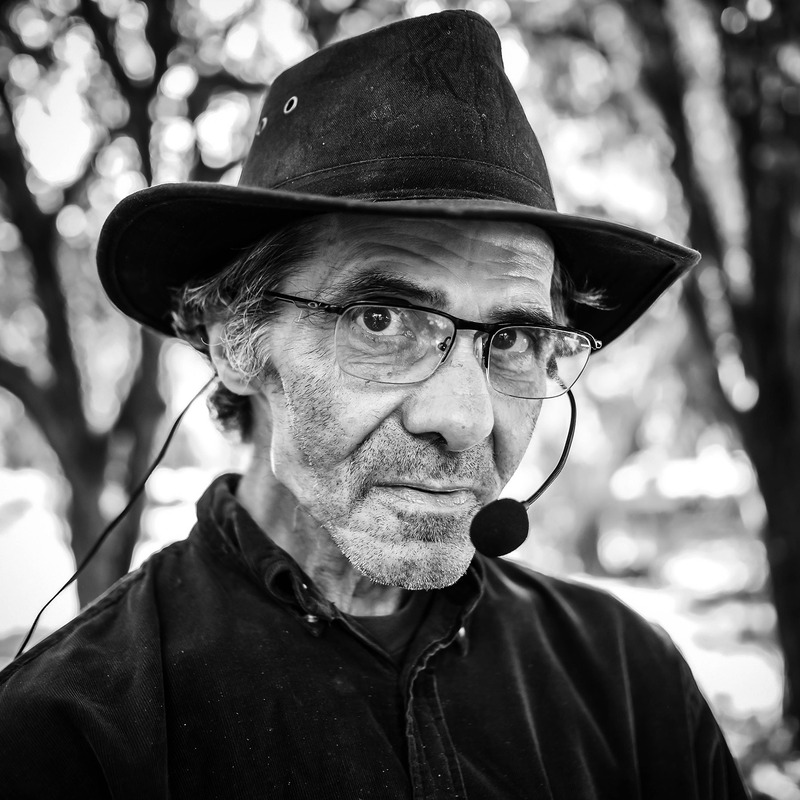 They have taught me never to make assumptions about who the homeless are. I admire their resilience. And their heart was as frigid as the frost. She came up and wanted a cigarette. That’s what homelessness can do to you. Another guy who had smokes. At least my son thinks I’m great! To move to a better place. And race or build cities for hours. Where I can build bikes and play. What can I say, I like to play. But being alone and on the streets? As a result of a tragic car accident. Am forced to live on a fixed income. I’m lucky to be alive, but I miss my home. I’m the same person I used to be. All your tears, and shame. And cause your body harm. Is what hurts you so deeply? 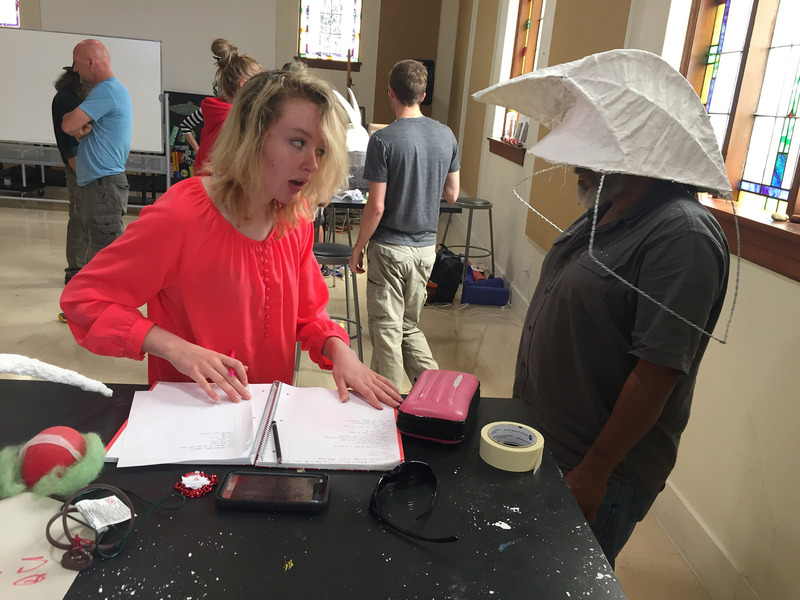 What is the pain you try to mask? These thing you are to me. I pray for you each day. There was an innocent little girl. She wanted to be just like him. He stole from her-something she could never get back. How could anyone do something quite like that? Her entire life became a fight, it was a struggle. No matter what she did, she just couldn’t get right. She ran and she hid, until one day she found a way to numb the pain. Oxycodone was the name of her new friend. The bond they shared seemed indestructible. He pushed her away from everything she loved. That new friendship would lead her straight to dooms day. That little girl was me- and as you can see-recovery is working its way right into me. The enemy had a strong hold over me. That little girl free from those dreams. A victim once or twice. And tried from day one. From which I once came. I worked full time most my life. The struggle got real and I lost some time. When I got sick and was hospitalized. I lost my home and had to rectify. That this homelessness could be my demise. My experience with homeless, didn’t begin until my early 40’s. 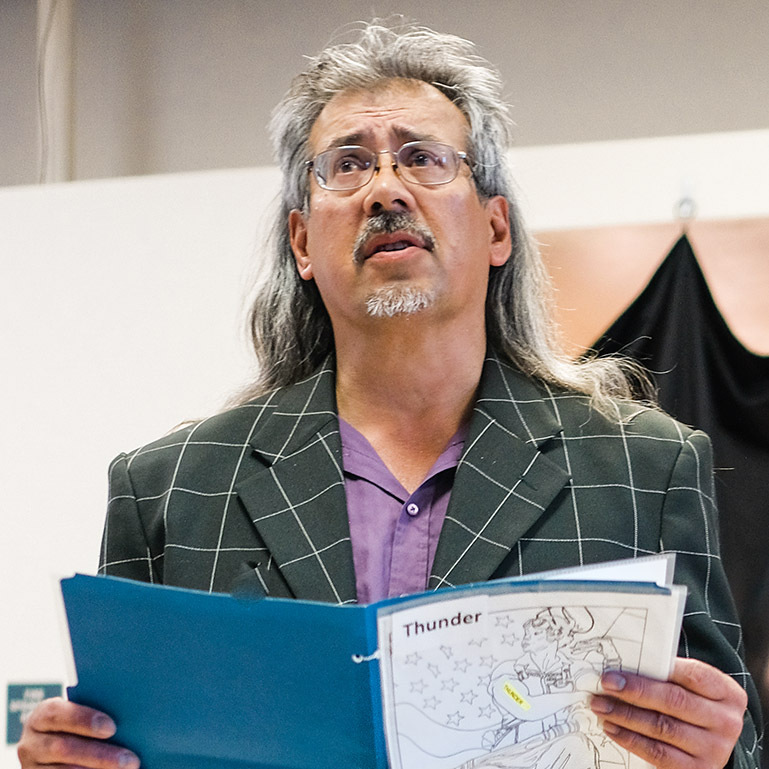 The choices I was making, hindered my ability to get permanent housing and employment. I would work and then get fired for my drug use. Eventually I ended up on the streets with a boyfriend who was abusive and condescending. While on the streets, I felt hopeless and helpless, that I would never get out of this dark hole. I had flash backs of the good times in my life. When I had a job, supported myself, was going to college. I had been clean for 7 years and everything just fell apart when I relapsed. I used drugs to numb the pain I was in. In July 2017 my life changed forever. The abusive boyfriend ran me over with his vehicle, resulting in internal and external injuries. When I was released from the hospital, I went to my mom’s and the boyfriend went to prison. 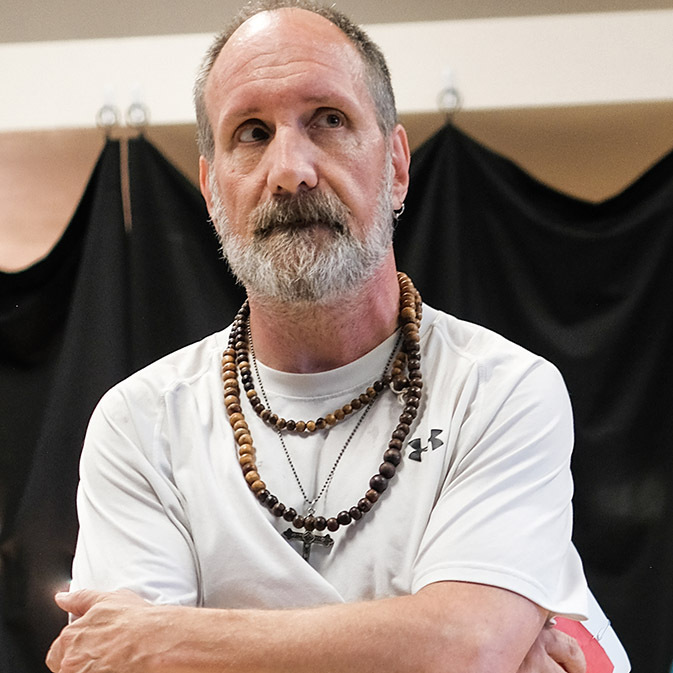 I was able to get into a drug treatment program by being persistent. I called every day for 4 months until I was accepted. Today I have a new perspective on life. I have God in my life, who brings me hope for my future. There is still a long road ahead of me. Being plugged in to a network of clean and sober friends and my family helps me maintain sobriety. My children wouldn’t talk to me for years. I lost time with my wife, my children, for so many years. Finally, I regained some of my children’s trust. It has taken more than 20 years. I would still like to have my own place again.